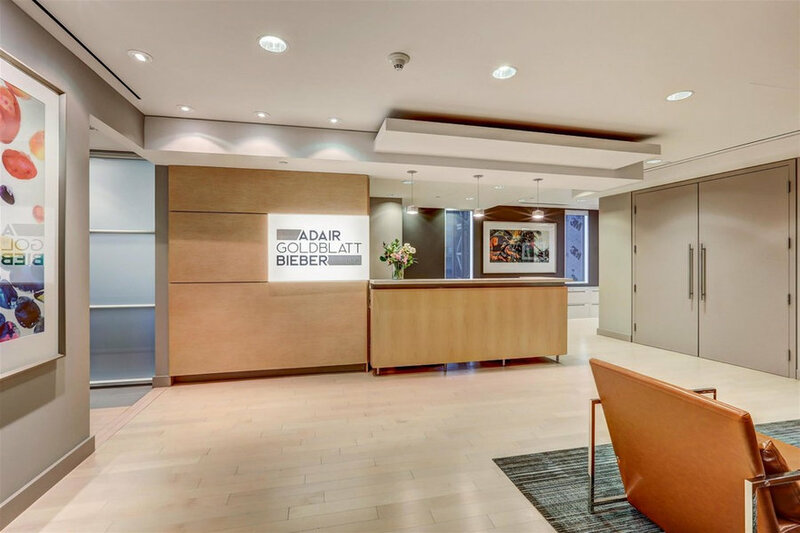 Adair Goldblatt Bieber LLP is a leading civil litigation firm, freshly formed by consolidating some of the most well-regarded trial and appellate lawyers in Canada. 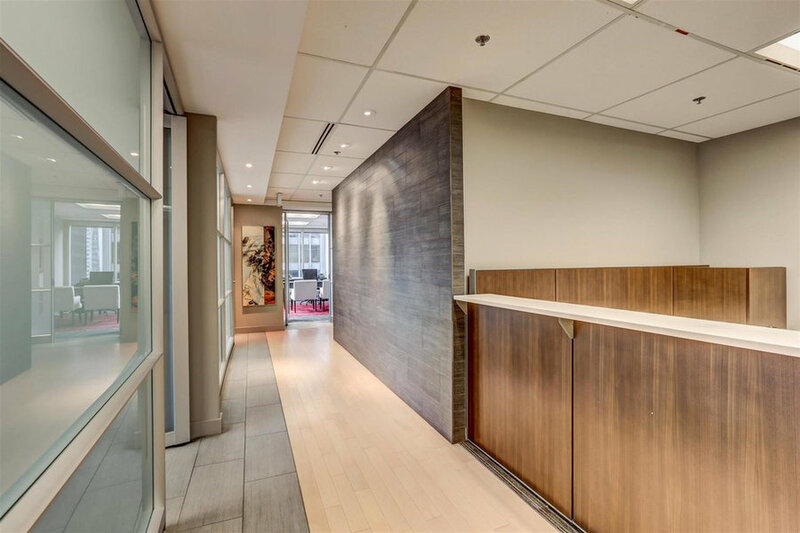 6,000 square feet of "as is" office space in Cadillac Fairview's TD Centre was secured with a mandate to move in 2 months. This was a fast-track project requiring precision focused action. 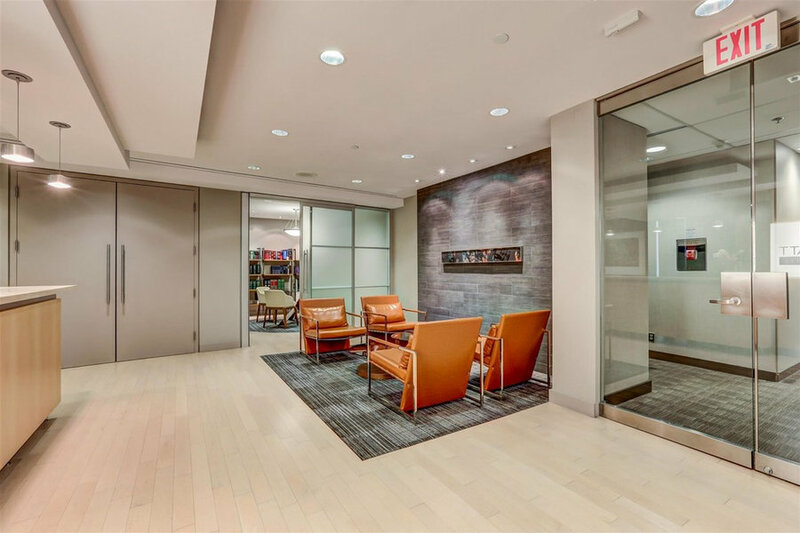 The interiors needed to align with their vision of a vibrant firm, precise, practical, adept, and innovative. With legal partners and associates coming from various firms, consultation, selection and approvals had to be expedited to ensure the client could move with as few interruptions to their work as possible. To achieve this goal Petroff Design worked with the current floor plan, minimizing demolition, strategically selecting new finishes to co-ordinate with existing materials. Furnishings and finishes were sourced from what was readily available or part of Quick Ship programs. The signage has an impact as soon as you step off the elevator, setting the tone for the reception; bright, dynamic and clean. 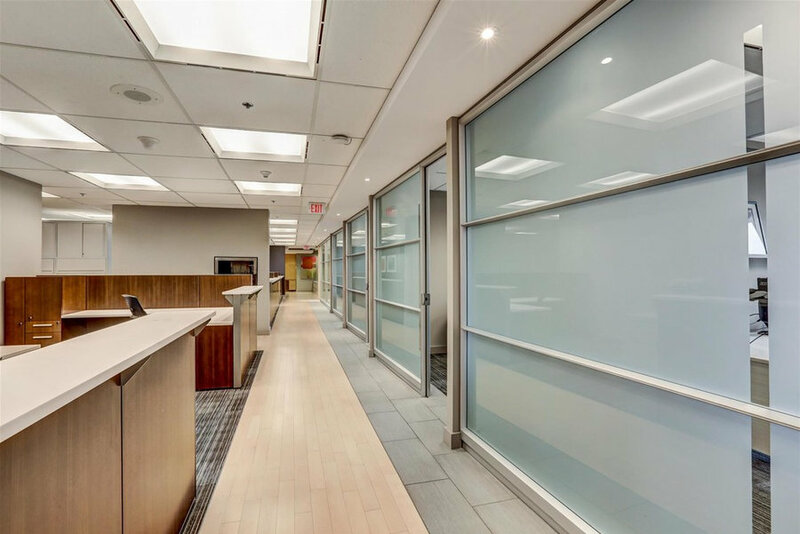 By working with the existing reception desk and electrical locations from the former tenant's sign, we were able to reconfigure new signage with minimal waste and cost. Dynamic armchairs in burnt orange leather with polished chrome frames are a fun interpretation of the overstuffed leather club chairs in law offices of the past, while still remaining stately and grand. Paint colours were carefully chosen to work with the existing wood floors to ensure the varied spaces are cohesive. With multiple works of art curated for each space, opportunity is given to explore and enjoy each piece. 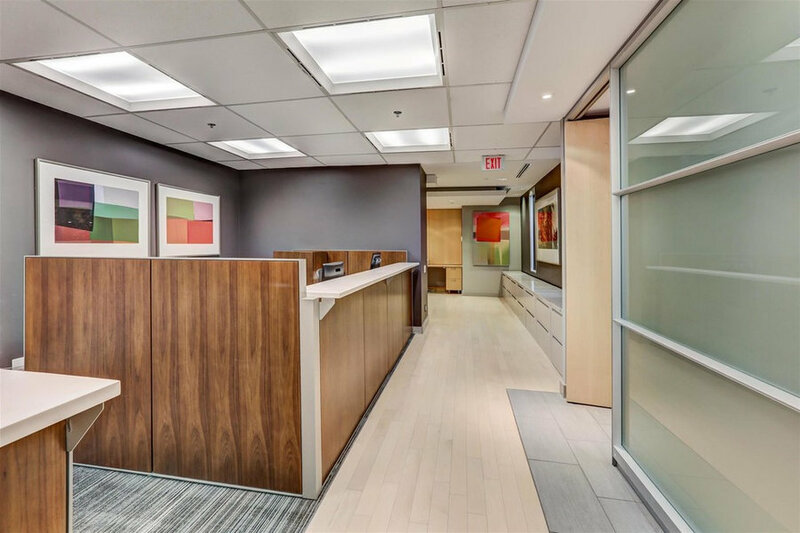 A combination of pendant lights and pot lights illuminate the reception area ensuring each work is highlighted, introducing energetic colour and movement throughout the space. 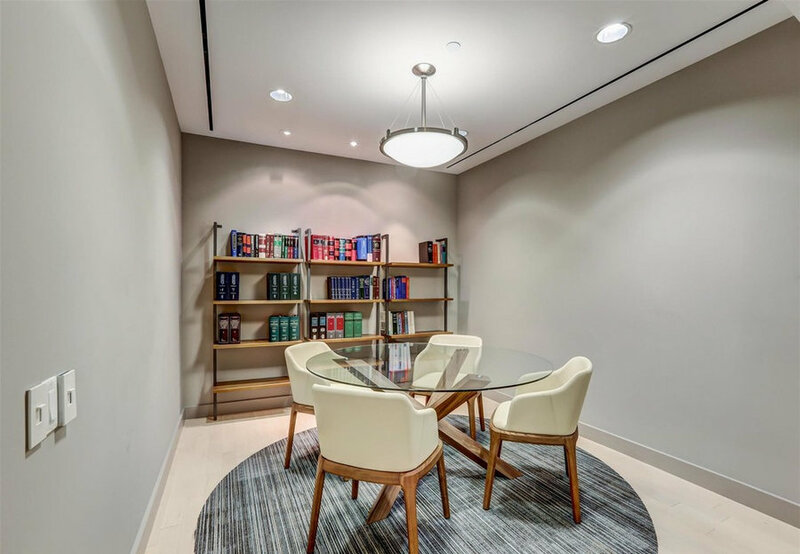 Sleek armchairs in cream-coloured leather are positioned around a sculptural glass table, while simple metal and wood bookshelves create a space where lawyers can meet with clients in a dignified and private setting. 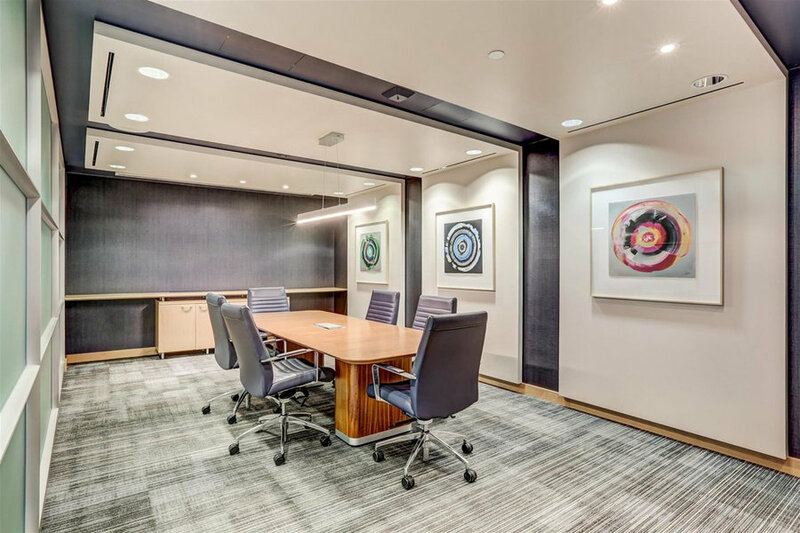 In this mid-size meeting room the abstract art selections serve to punctuate and break up the linearity. 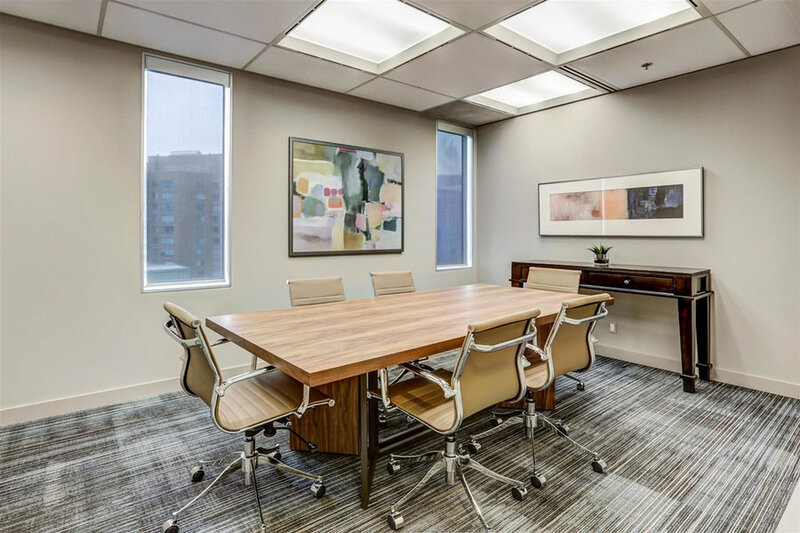 Tan leather and polished steel chairs create a light and reassuring space, while a substantial wood boardroom table and darker tile carpeting grounds the space. 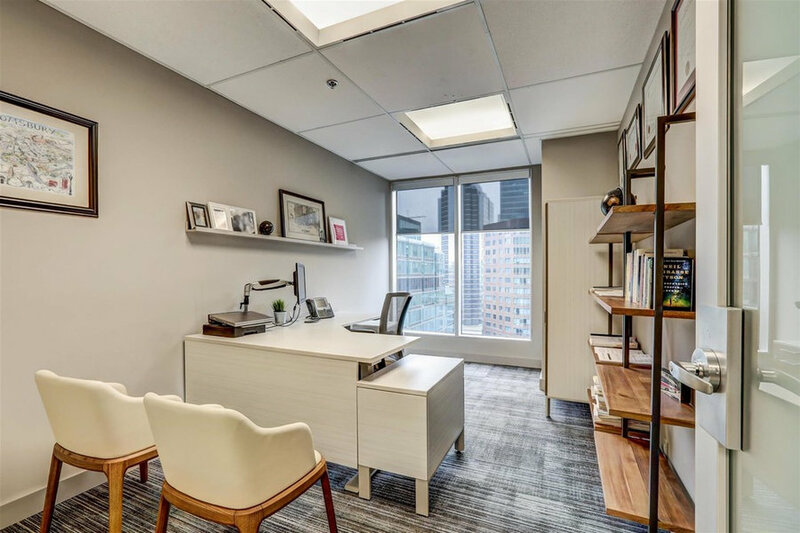 With client's coming into the office space to discuss potentially stressful legal matters, creating a space that is dignified, calming and private was vital. 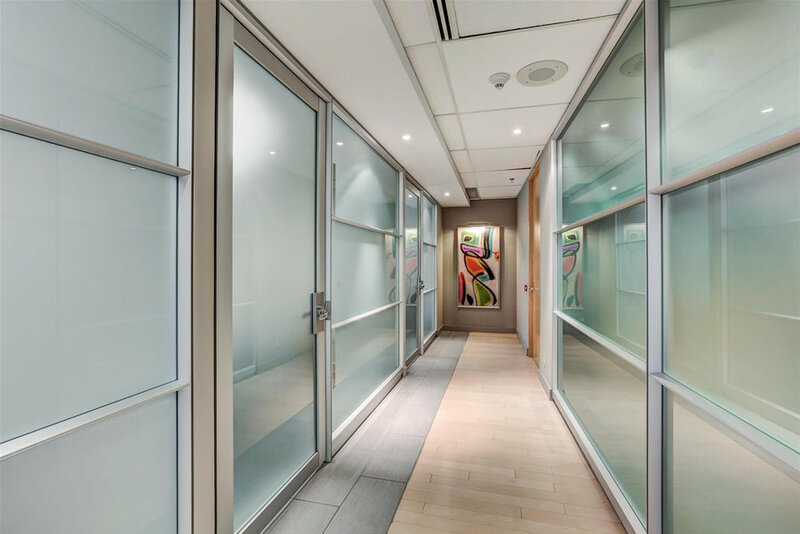 Frosted glass partitions with a small reveal ensure privacy is maintained while still allowing natural light through out the office. 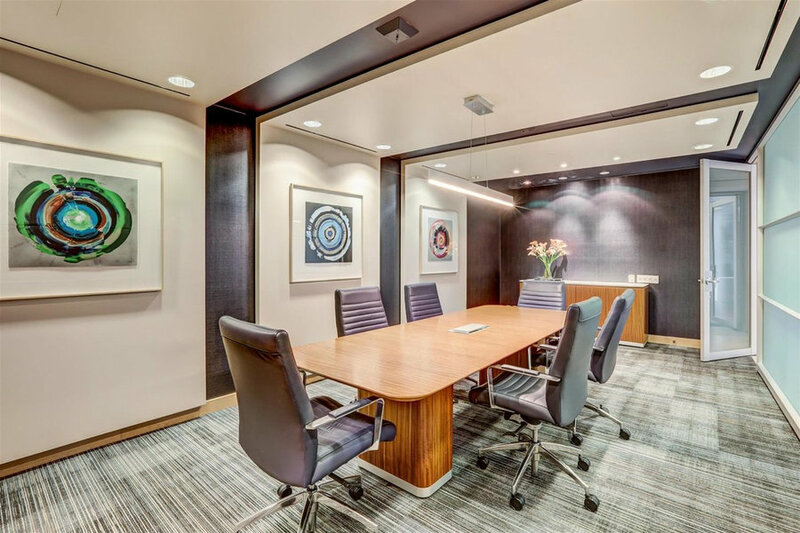 Channeling the firm’s professionalism, the main board room was inspired by the refined look of a tailored men’s suit with richly textured dramatic navy wall coverings. The artworks are chosen to provide colour pop and focus. 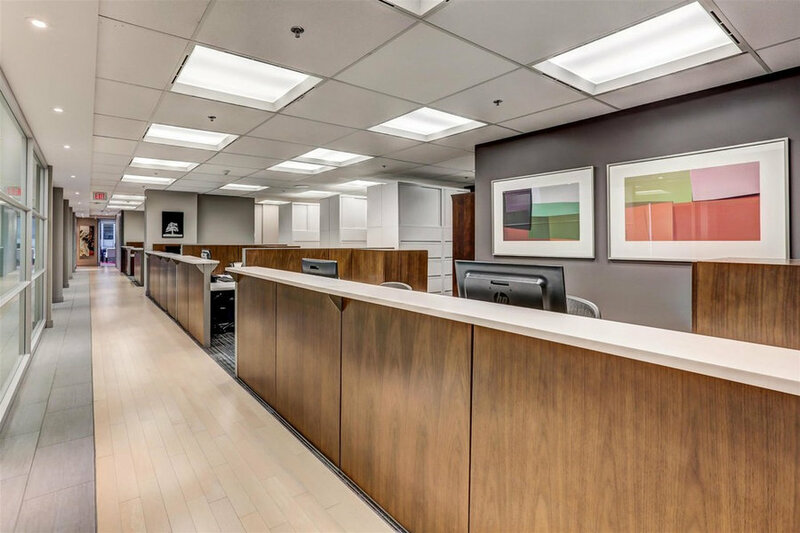 A sleek and sophisticated suspended LED light replaced the outdated and malfunctioning former light fixtures. 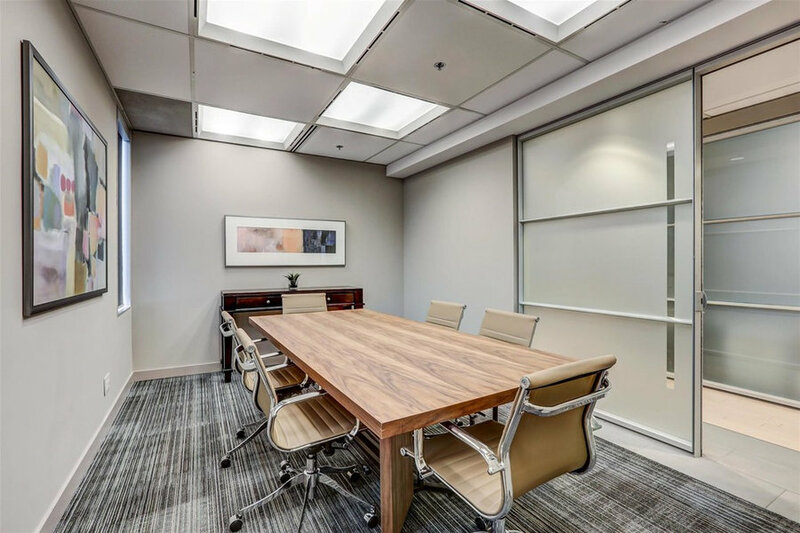 Frosted glass partitions ensure privacy while still allowing ample natural light into the main boardroom. 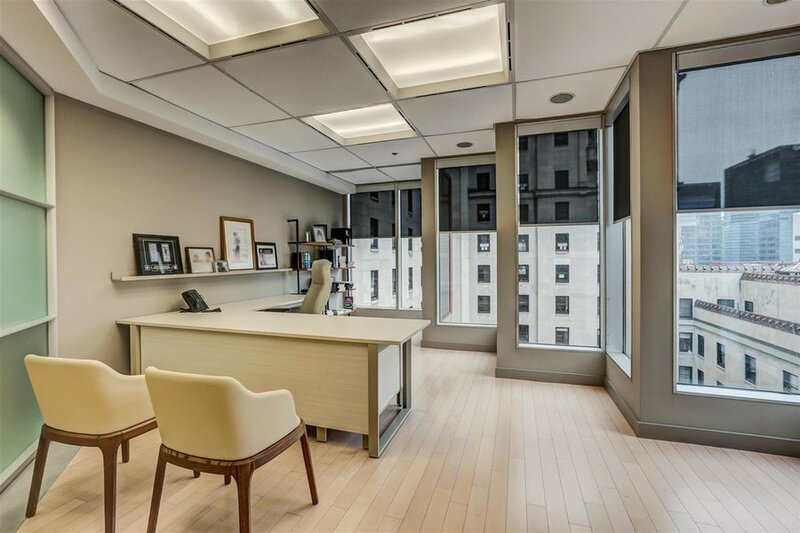 New roller shades were installed which allow for individual light control in each office while still highlighting the downtown Toronto view. A tranquil palette of blonde wood, brushed metal, and cream-coloured leather were chosen to work with the existing wood floors. Wardrobes were installed in each lawyer's office to ensure discreet storage. 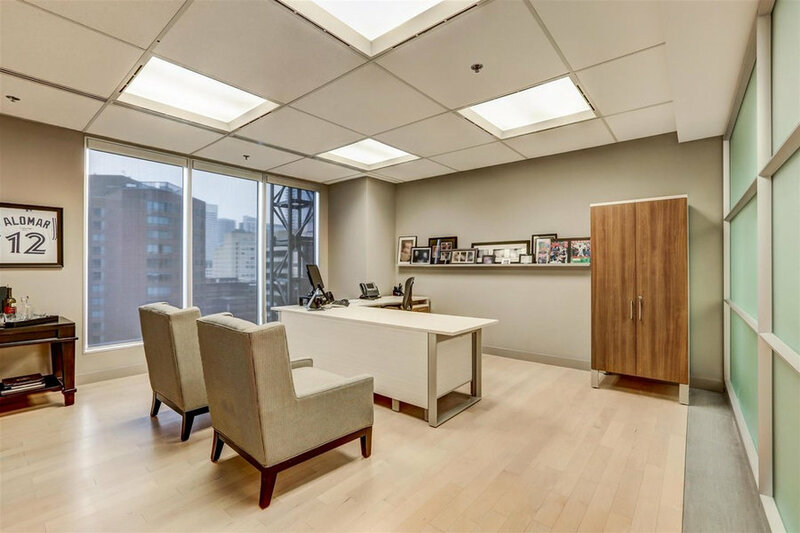 By anticipating employee needs, we an enable clutter-free and organized work spaes which are ready for day-to-day use and presentable during client meetings. Identical bookshelves and picture rails were installed in each office to instill unity through out the entire space, while still allowing for each person to customize their space with their own framed art, photos, and degrees. This way each space is a reflection of the individual while still being cohesive and professional. The existing space had multiple materials already installed. Rather than replace them, which would increase cost and delay moving in to the suite, we decided to keep the existing materials and compliment them with carefully chosen finishes. Warm neutral paint colours were paired with dynamic and engaging art. 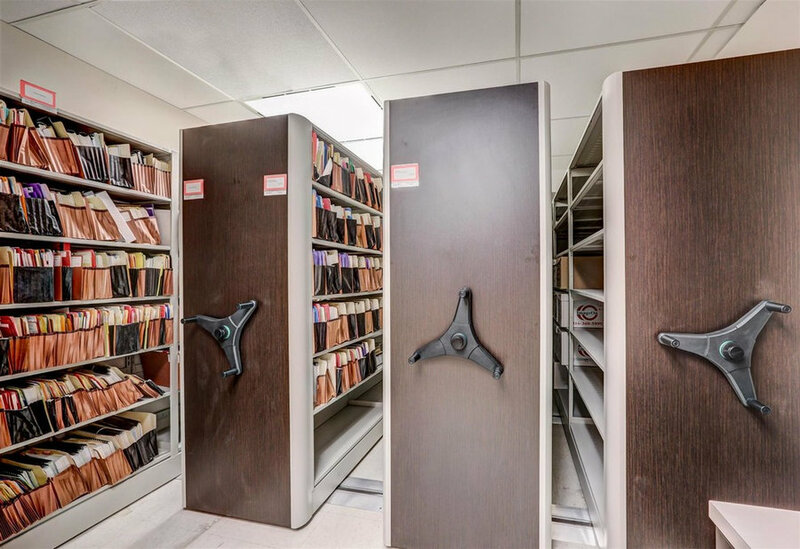 The administrative area not only needed space for several people to work effectively and efficiently, but secure storage as well. Lateral filing units were installed as well as matching desk station which provide work surfaces and built-in storage. Additional desks were installed in order to accommodate future growth. Complimentary carpet tile was installed that highlights the linear lines of the already existing wood and tile floors, creating visual harmony between the different floor finishes. 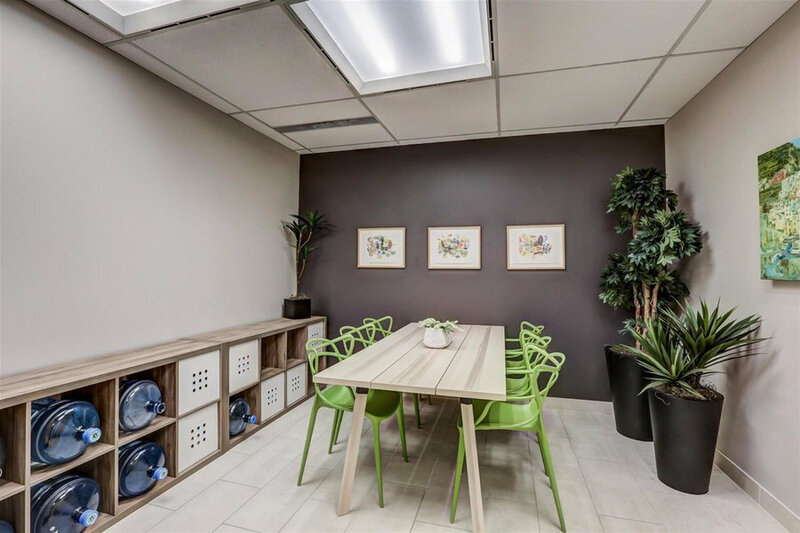 While including storage and work areas was vital to the overall design function, art curation also played a huge role in designing a beautiful work environment. In almost all rooms from almost all angles, colourful and captivating art can be seen and enjoyed. Frosted glass not only creates a modern and sleek aesthetic, it allows corridors and interior rooms to be filled with natural light. 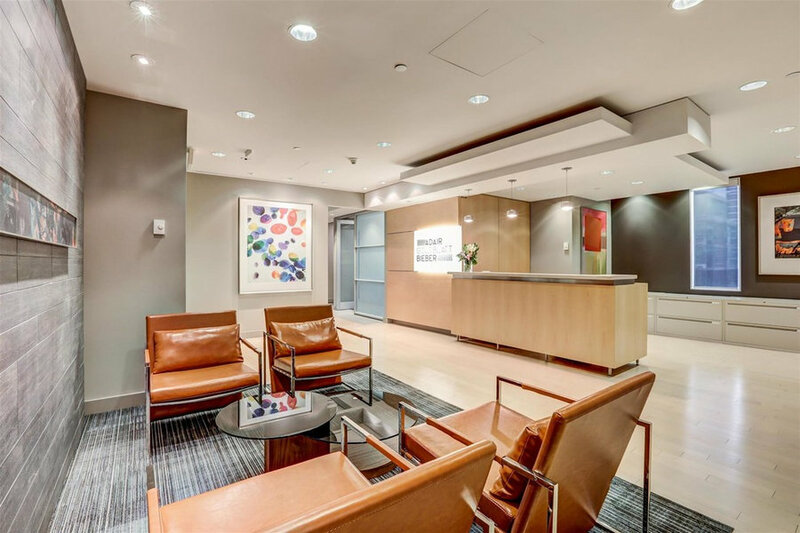 Strategically placed art and custom lighting draws the eye down the corridor. A neutral palette of materials and finishes means bold shapes and bright colours can be introduced with each curated work. As an interior room with no windows, choosing bright and cheerful furniture was critical in making an inviting common space that people would actually use. Ample seating and storage ensure everyone is comfortable and that the space is functional too. High density filing storage needed to accommodate 1000 lineal feet of storage. This system had to be approved by the building's structural engineer to ensure the floor could bear the potential weight loads. Installed on tracks, the storage system is convenient while maximizing storage.